Love and compassion are at the heart of domestic labor, yet historically, domestic workers have been rendered invisible—by society and in the eyes of the law. Mostly foreign-born women, these workers have been excluded from labor protections that workers in the rest of the economy take for granted. However, in the past decade, a growing movement has emerged calling for domestic workers to share in the same rights guaranteed other workers, which is likely to lead to one of the most critical and encompassing labor battles of the twenty-first century. Part of the Family? 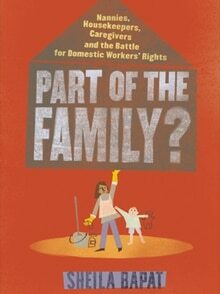 Nannies, Housekeepers, Caregivers and the Battle for Domestic Workers’ Rights chronicles the rising political and social movement to secure labor protections for domestic workers who toil in our homes cleaning, cooking, and caring for our children and elders. Through interviews with the leaders and activists who are forging new and unlikely political alliances among workers, employers, policymakers and other social justice movements, as well as analysis of the historical underpinnings of the current fight for improved conditions and protections for domestic workers, this important and timely book will shine an overdue light on the invisible laborers who are so critical to our economy (and our families).